A large Dunstable SC squad travelled to the Watford County Qualifier Open Meet recently. This meet was a level 3 gala and perfect for many swimmers to achieve county times needed for the new year, as many medals, PBs, county times and even new Junior county records were recorded. In the 400m freestyle, Jessica Kefford and Millie Dudley both achieved new PBs, while Skylar Alderson, Jenny Davis and Millie Dudley earned new bests in the 100m breaststroke, as did Daniel Richards and Callum Shepherd. Will Hamm had a PB in the 200m backstroke, Hannah Swan took 20 seconds off her 200m IM best, while Bethany Harwood clocked 3.03mins, as Joshua Hamm and Austin White both got PBs in the 100m freestyle. Walter Hackett and Ollie Ellison swum bests in the 100m backstroke, with Hackett grabbing a new Bedfordshire County all-time Junior record, in that event and the 100m IM. There were also huge PBs from Bryony Mathias (1.25.10) and Jessica Medlicott (1.23.83) in the same race, as Annabella Vassallo-Todaro timed 1.19.16 in the 100m backstroke. Hannah Swan managed a 24-second PB of 3.24.31 in her 200m breaststroke, with bests also for Jenny Davis (3.33.31), Thea Brazel-Hawkins (3.28.15) and Rhianne Carrick (2.58.94). In the 100m butterfly, Daniel Tuffnell got a PB of 1.06.11 with Myles Mathias on 1.06.58, while in the girls race, Lily Swan (1.27.32) and Jessica Kefford (1.15.38) both got PBs, as did Eloise Harper. Daniel Richards broke the 40 second barrier for the 50m breaststroke in 39.32, with PBs coming from Michael Judd and Walter Hackett. For the girls, Chloe Medlicott (48.02), Thea Brazel Hawkins (43.31) and Rhianne Carrick (38.10) all swum bests, while Kathryn Kirkwood had a fabulous time of 43.42. In the 200m freestyle, there were fine swims by Kieran Murray (2.11.12), Callum Shepherd (2.10.89) and Will Richards (2.05.25). Jenny Davis had a fantastic 2.48.90 in the girls event, with Ruby Collins swimming 2.18.24 and a blistering 1.03.77 to win silver in the 100m freestyle. In the 50m backstroke, Cameron Vassallo-Todaro set a fantastic PB in 48.75, Louis Ellison was on par with a 43.13 and Austin White beat his entry time with 39.46. PBs were secured by Daniel Richards (37.74), Kieran Murray (33.46), Callum Shepherd (31.72) and Myles Mathias (32.45), while Ollie Ellison was on PB with 31.24 with Walter Hackett just off his with 27.43. In the 50m girls’ backstroke there were fine swims by Skylar Alderson (39.88), PB, plus Hannah Swan (41.69), Chloe Medlicott (38.85), Bryony Mathias (37.85) and Isabel Tuffnell (39.23). Amy Shaw had a brilliant meet and soars into Counties on all three backstrokes with a 37.33 for her 50m. Annabella Vassallo-Todaro dropped hers down to 35.23 and Lily Swan timed 37.30. There were a number of swimmers in the 50m freestyle, with George Wallis-Smith clocking a PB of 32.73, while 11-year-old’s Bryony Mathias’ effort of 31.86 broke a club record set in 1996. Walter Hackett had another fine weekend, with his seven swims leading to five new club records and two Junior County records. Meanwhile at the Hitchin Open, Thomas and Holly Fantini achieved some amazing results, as eight races between the pair led to two silvers, five PBs, and a gold for Thomas, while he managed a new county time and four second PB in the 200m freestyle. Holly finished her very long day with a nine second PB in the 50m butterfly. 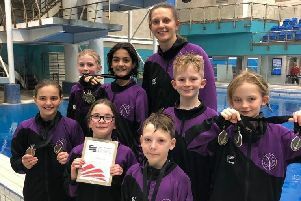 Elliot Kefford and Maisie Humphrey headed to a Beds Development Day in Bedford, while Kieran Murray swam for his school in the National Finals at the London Aquatics Centre in Stratford.